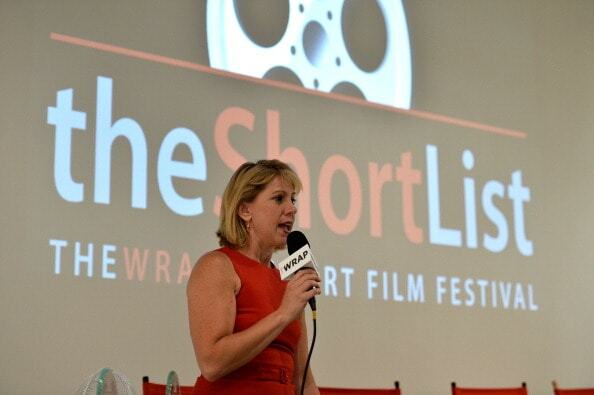 TheWrap's ShortList Film Festival ceremonies were held at the Santa Monica Art Studio at Santa Monica Airport. TheWrap's founder and CEO Sharon Waxman welcomes guests. 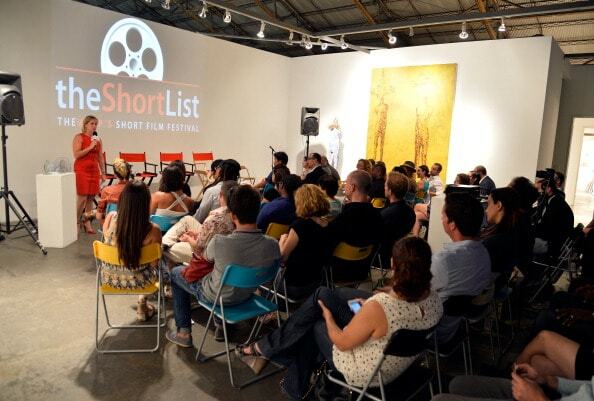 The festival's jury discusses short films and their place in the industry. The panel consisted of (from left to right) "Short Term 12" writer/director Destin Daniel Cretton, producer Jonathan Schwartz, "Lifeguard" writer/director Liz Garcia, Relativity Media development executive Richard Potter and "ShortList" director of programming Mike Plante. "I think it can be kind of detrimental to a young filmmaker to be thinking of a short film as a calling card," Cretton said. "I see so many short films that a filmmaker will give me, or my students, and they'll make something and call it their calling card, which shows different things they can do. And it just doesn't work as a film." "I never made a short, I've just been writing," Garcia (center) said. "Just thinking about why I never did it, I was working up my courage to direct and I was afraid to make a short. And that makes me think everyone should make a short." "It's become a little bit of this cultural phenomenon of people who want to make a film," Plante (left), the short film programmer for the Sundance Film Festival, said. "It's really, really easy to tell who's doing a good job of it and really working at it." Cretton and Schwartz disagreed on the value of making a short that can serve as a "calling card" to the industry.Â "If there's a specific project you want to get made, a short can help," Schwartz said. Goran Dukic's "What Do You Have In Your Pockets," an animated love story that unravels when the objects in a young man's pockets come to life, received an honorable mention from the jury. "Magnesium," about a talented gymnast who makes a life-changing discovery as she prepares for an important tournament, earned an honorable mention. Ritesh Batra'sÂ "CafÃ© Regular" was the jury's selection for the Industry Award. It focuses on a couple who work-out their first major crisis in a cafÃ© in Cairo. Earning the most votes, Martin Rosete's "Voice Over" won the Audience Award, as an unseen narrator tells three extreme tales of survival. "CafÃ© Regular" director Batra accepted the Industry Award over Skype.Â "Thanks to the Jury, I'm so glad this resonated with you. This short is really close to my heart," Batra said. "Things are not as ideal in Cairo as they were when I made this short, so this goes out to my friends in Cairo who are still there making art." "Voice Over" director Rosete accepted the Audience Award over Skype.Â "I'm in New York right now, so it's a pity I couldn't be wtih you tonight," Rosete said. "I couldn't be happier that 'Voice Over' won the Audience Award at TheWrap's film festival, so I just have to thank the audience for voting for the film. Thank you so much." Producer Pau Brunet accepts the Audience Award on behalf of "Voice Over" director Rosete. 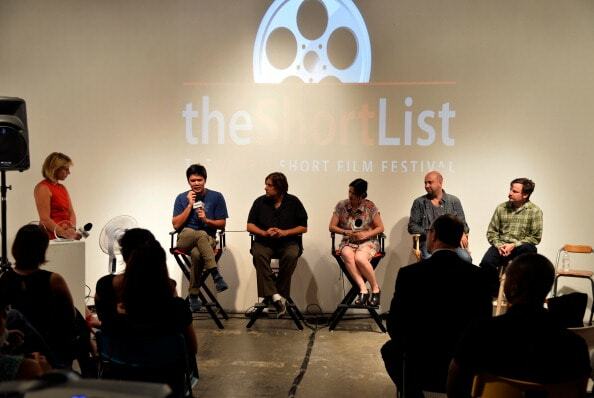 The Shortlist Film Festival jury (from left to right): Mike Plante, Richard Potter, Liz Garcia, Jonathan Schwartz and Destin Cretton. Bec Smith and Ted Hope, also on the jury, are not pictured. TheWrap's awards editor Steve Pond with Liz Garcia and Destin Cretton (from left to right). Mike Plante, Richard Potter, Liz Garcia, Jonathan Schwartz, Destin Cretton and Sharon Waxman (from left to right).